This square cake is covered in white fondant with blue and chocolate brown stripes. 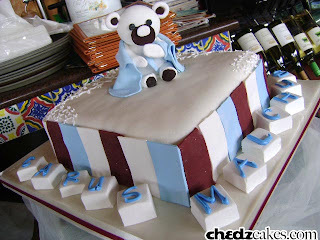 A cute teddy bear sits on top. Below are 'toy blocks' to spell out the baby's name. We actually made two sets of this cake because it was for twins!